Welcome to Apex Legal Group, PLLC, an organization dedicated to providing professional, personalized, competent legal representation. Our group is dedicated to building relationships with our clients through quality legal representation and personal attention to the specific details related to your legal issue. 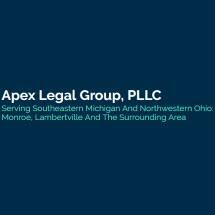 Apex Legal Group, PLLC has attorneys that will service clients in all Southeastern Michigan jurisdictions, and has its headquarters conveniently located in Monroe, MI. Apex Legal Group, PLLC has counselors who specialize in Divorce and Family Law related matters, Criminal and Traffic matters, Bankruptcy, and Estate Planning.